If you haven't already received the shocking email from Circles.life today, well it's official on the news now. 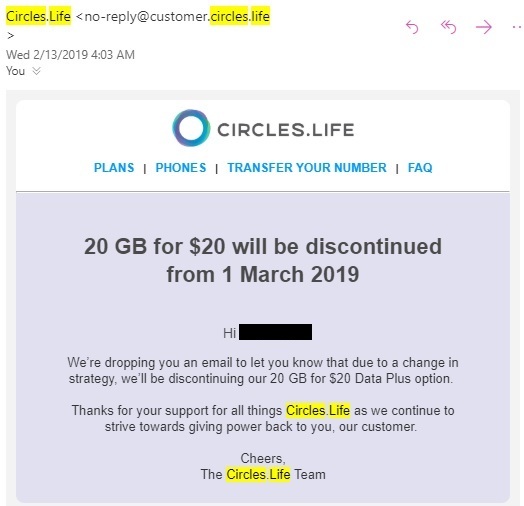 Circles.life to discontinue optional 20GB for $20 plan. I'm guessing there's something better coming up with competitors like Starhub etc launching 30GB no contract data plans etc. Singaporeans are so spoilt for choices now. Let's wait for the announcement on Thursday. If they're not coming up with better deals. Bye bye to them. I cancelled this add on a few weeks ago. Cos they were giving out free 18gb for new users, so i msg-ed them to give it to me also and eventually they did. Once i got it, i got rid of the paid 20gb. I'm guessing something even better will be unlimited data as per the competition. Edited by Mockngbrd, 13 February 2019 - 02:26 PM. The base 20gb/month not enough for you? My circles.life base plan is only 6GB for $28. Clever move. Should have done that too. I cannot even finish 20gb. Wa, unlimited data for $20?! Would have been better if $20 base plan with unlimited data, instead of optional add on $20 for unlimited data. Lol. It's quite impossible for me to finish up the 26GB that I have after add on, so a overall price reduction instead of unlimited data would be my ideal plan hahaha. Oh Wells. First World woes. too late for the free 18gb. dang. smart move birdy! Looks like I'd still be doing those bonus questions weekly. I look at Circles plan, i find the pay as u roam data concept weaker compared to paying for 1gb data just for whatsapp/google (singtel) or the m1 data passport. Base plan of $20 and comes with unlimited data a bit impossible le. Other telco with based plan come with unlimited data quite pricey lo. Circle life so far so good. $28 + 2 for free incoming. My 7G plan is enuff. Ocassionally top up for extra 1G. See if other telco got good deal if I wanna change phone then jump. Otherwise quite cheap compared to Singtel. If it's true, time to switch. But partially is only valid for 2 years, right?